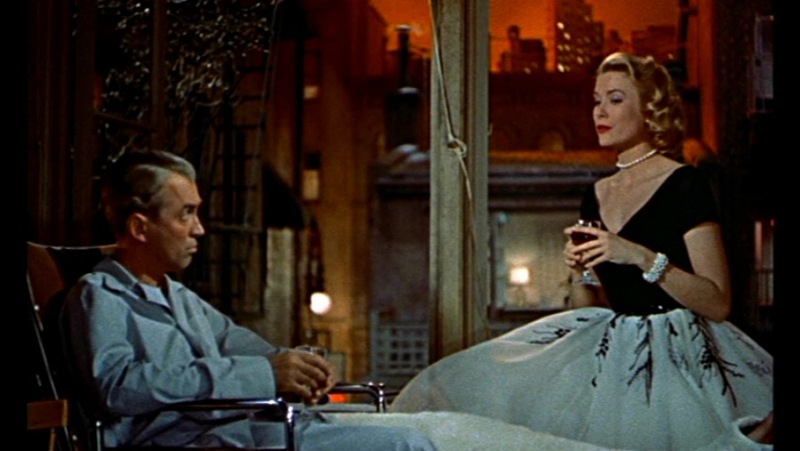 Mr. Hitchcock has an excellent point: “Rear Window,” released in 1954 and starring James Stewart and Grace Kelly, is a sublimely told tale that can be viewed on multiple levels. 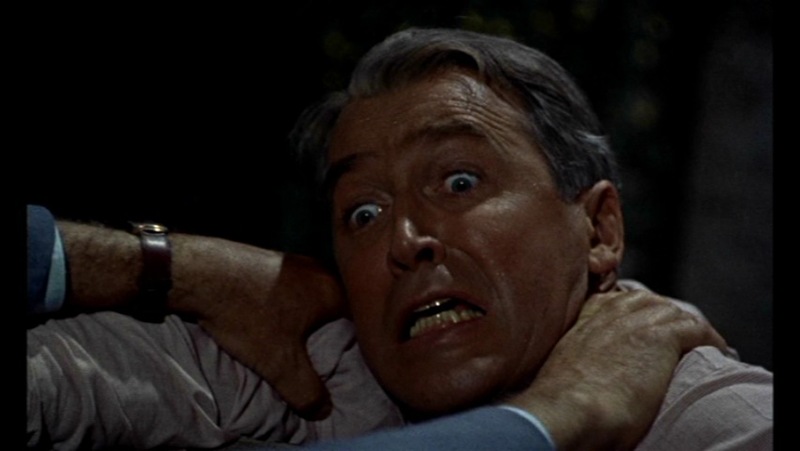 Its suspense, wit, sexuality, and mature themes make it one of Hitch’s greatest and most satisfying films. 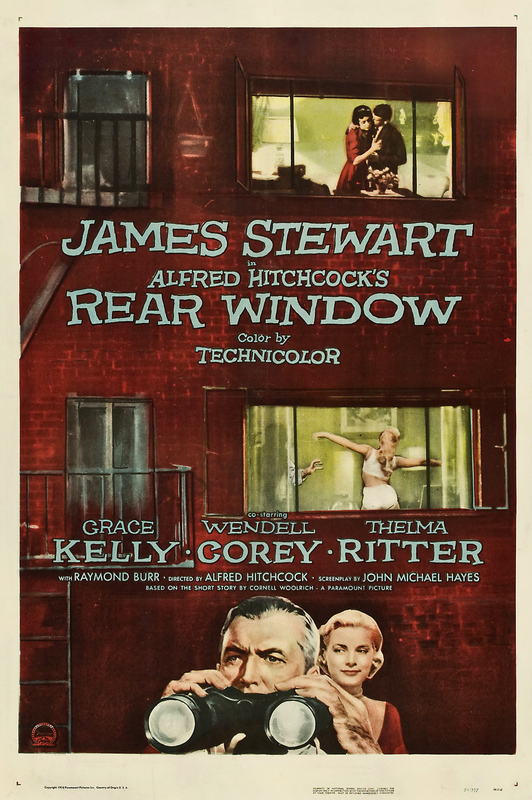 Based on a short story by Cornell Woolrich and featuring a sparkling screenplay by John Michael Hayes, “Rear Window” is the story of L.B. Jeffries (Stewart) a photographer and man of action who’s stuck in his New York apartment during a summer heat wave, thanks to a broken leg. His entire world has been reduced to what he can see across his courtyard, a narrow view that’s like a camera’s viewfinder. Bored as he is, he’s gotten to know his neighbors in a strange way: by watching their comings and goings, he’s learned about their lives. From his wheelchair, Jeffries can see a desperately lonely woman; a energetic dancer; a struggling composer; an abstract artist; a middle-aged couple; and a traveling salesman with a nagging, sickly wife. Jeffries is kept company by a visiting nurse, played with frank wit by Thelma Ritter, and his girfriend, Lisa Fremont (Kelly), who works at a fashion magazine. While they seem to love each other, Jeffries keeps her at arm’s length, claiming that his whirlwind lifestyle would clash too much with her world of cocktail parties and glamor. Even their accents keep them apart; he sounds down-home, while she has an educated, upper class accent. 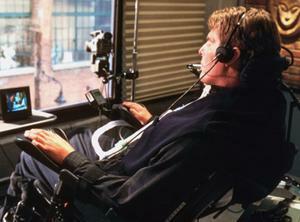 On a sweltering night, Jeffries is awakened from a restless sleep in his wheelchair by a scream. Looking across the courtyard, he thinks he sees some activity from the salesman’s apartment. Has the salesman done something to his wife? 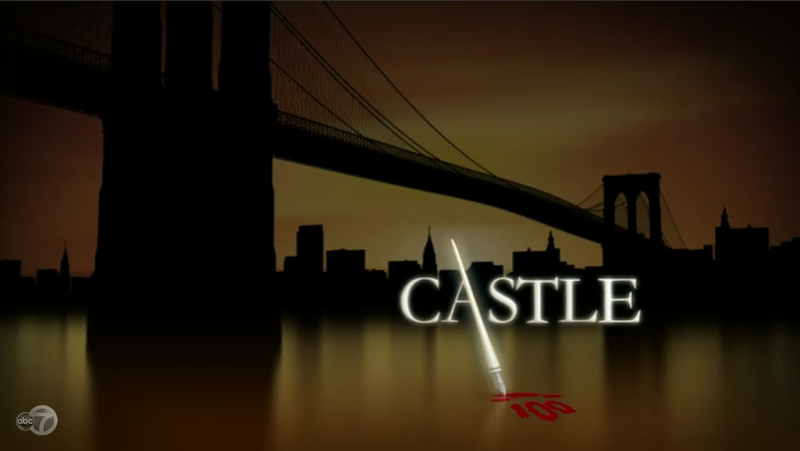 Jeffries realizes that the wife seems to have disappeared, while the salesman himself is acting suspiciously: leaving the apartment over and over in the middle of the night, making strange phone calls, bringing in contractors to paint the apartment and more. 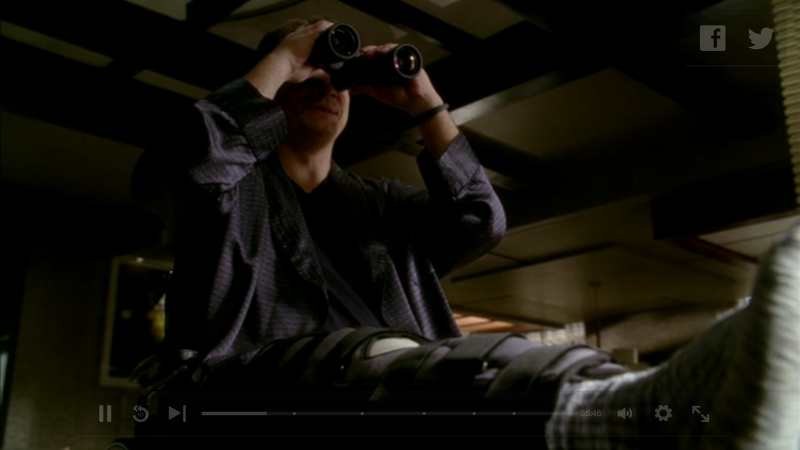 Using binoculars and a camera with a telephoto lens, Jeffries tries to gather evidence. He talks it over with a friend from the police force, who says there isn’t enough evidence to act on. Fremont, too, is skeptical, arguing that Jeffries is merely bored and imagining things, until, in mid-sentence, she looks out and sees the salesman tying up a huge trunk with heavy rope. Suddenly, the conversation is no longer about Jeffries; it’s about the salesman. 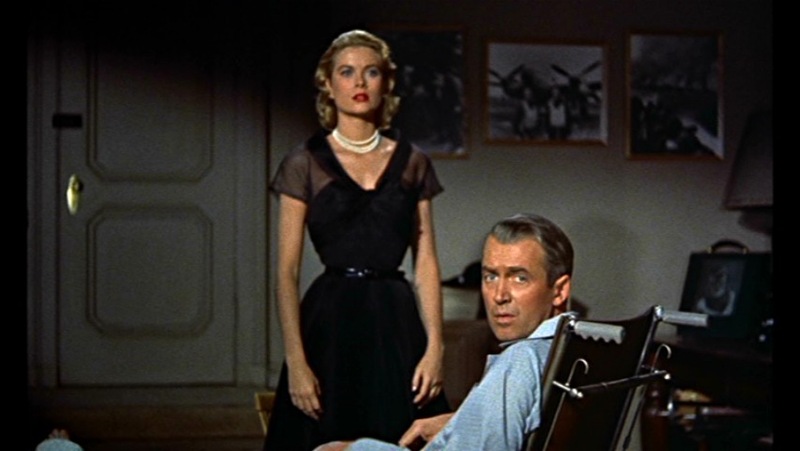 That turn of attention, in which Grace Kelly stops acting like an annoyed girlfriend and begins acting like a witness to a crime, is one of the great moments of the movie. Together, she and the nurse carry out Jeffries’ legwork. When a dog that had been digging in the salesman’s garden turns up strangled, the two women dig up the garden themselves. Finding nothing there, Fremont breaks into the salesman’s empty apartment; there, she finds the wife’s wedding ring, but does not manage to escape before the salesman returns. Watching the action from across the courtyard and unable to do anything, Jeffries sends the police to the apartment. They arrest Fremont, but not before she signals Jeffries. Unfortunately, the salesman sees the signal and, in a truly chilling moment, looks directly into Jeffries’ apartment. Jeffries now feels he has enough evidence against Thorwald, so he makes a call to his police friend, but with the nurse off to bail out Fremont, Jeffries is alone in the dark when he hears the heavy footsteps of the salesman, Lars Thorwald, approaching. Thorwald breaks in, and Jeffries slows his approach by briefly blinding him with flashbulbs, but Thorwald reaches him at last. He attempts to strangle the photographer and, as the police arrive, hangs Jeffries out the window in an attempt to kill him. Jeffries falls into the courtyard – and out of the frame through which he’s watched so much – as the police grab Thorwald. In the end, the small world of the courtyard is once again at peace; the couple with the dog have a new pet; the lonely woman has met the composer. Fremont sits near Jeffries, now nursing a second broken leg; for the first time, she’s wearing something simple, jeans and a blouse, rather than a gown. The adventure has brought them together. Jeffries has seen that she is tougher than he ever realized, and she is now convinced of his commitment to their relationship. 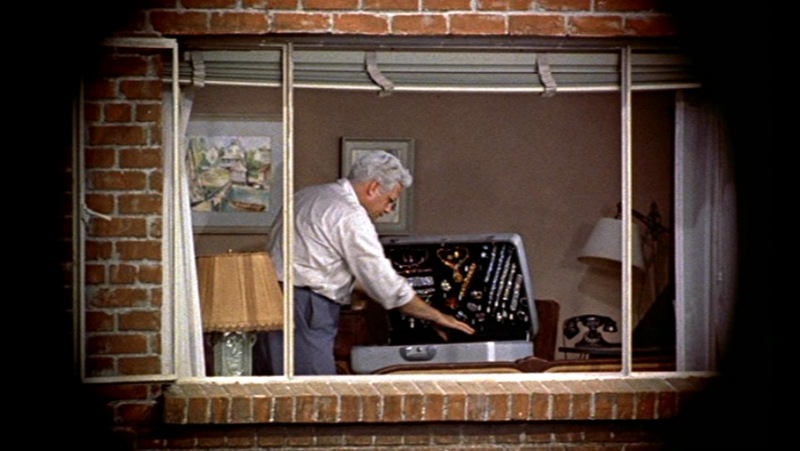 One of the hallmarks of “Rear Window” is Hitchcock’s manipulation of sound. Snatches of conversations are heard from across the courtyard, along with pop music, parties, arguments and traffic from the street beyond. 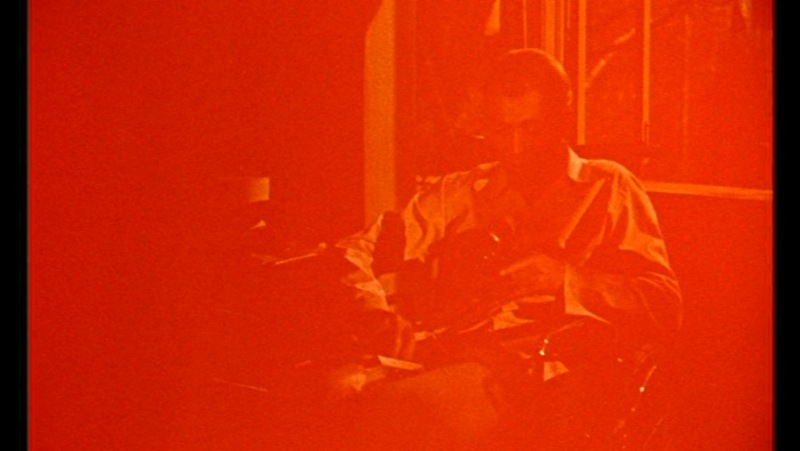 The sound contributes to the movie’s overall theme of alienation; as is typical in New York City, the apartment dwellers barely seem to know each other. 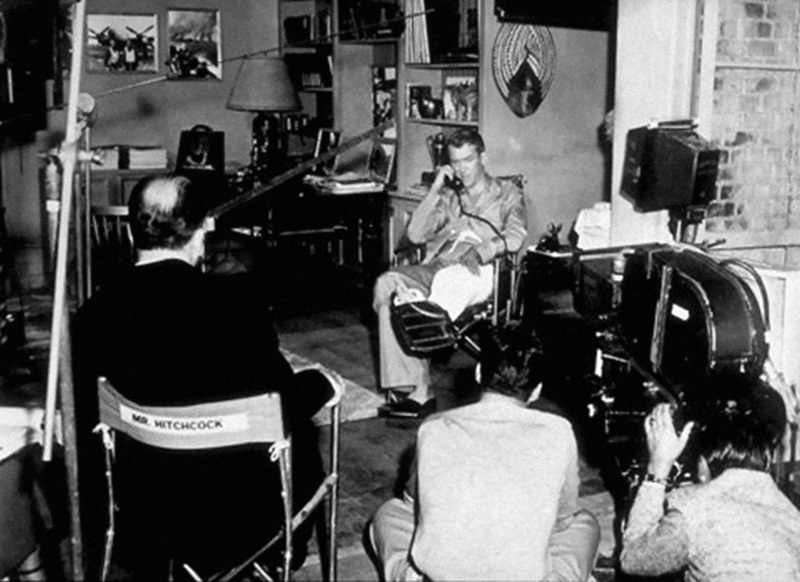 The movie was shot in Hollywood on an elaborately designed set. Hitchcock loved to know the spaces he would be working in, and few of his movies have a more well thought out space than this one. The lighting of the courtyard, which is seen at all times of day and night, help to bring it to life; as in so many of Hitch’s films, the setting is a character in the story. Shot in widescreen, the apartments and buildings divide and subdivide the screen into cubicle-like spaces. From the start, the viewer is plugged into Jeffries’ voyeuristic view of the courtyard dwellers. Although we see less of the stories that don’t involve murder, we do get caught up in the loneliness and desperation of the dancer, the spinster and the composer. Each of their mini-stories has its own neat conclusion, like the end of a Shakespearean comedy, with everyone paired off. Aside from the stars, Stewart and Kelly, the rest of the cast is a pleasure as well. 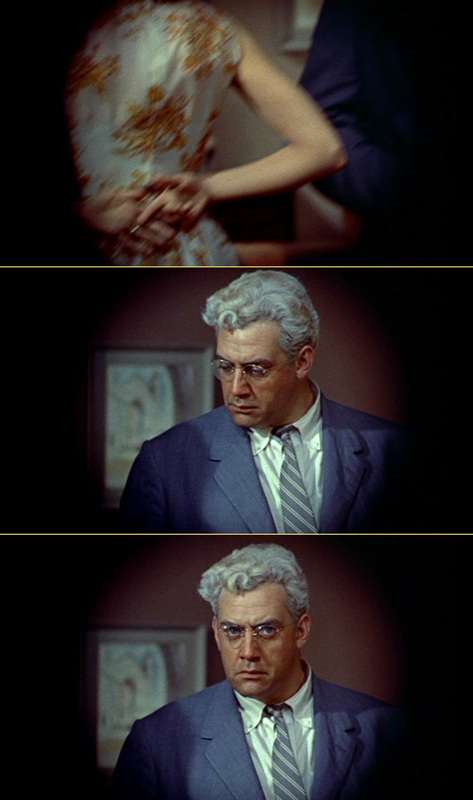 Raymond Burr glowers and storms through the set as Thorwald; Thelma Ritter blurts out the things audiences didn’t want to imagine, like where Thorwald cut up the body. The other notable name in the cast is Ross Bagdasarian, who plays the composer; he previously co-wrote the hit song “Come On-a My House,” and would go on to fame as David Seville, cartoon impresario behind The Chipmunks. In an early scene, Alfred Hitchcock can be seen visiting the composer in his apartment. 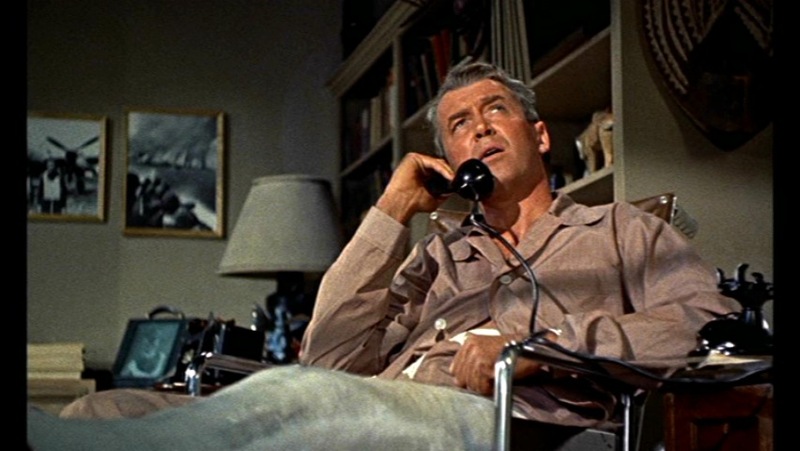 There’s a new maturity to “Rear Window” that had only been hinted at in earlier Hitchcock films. 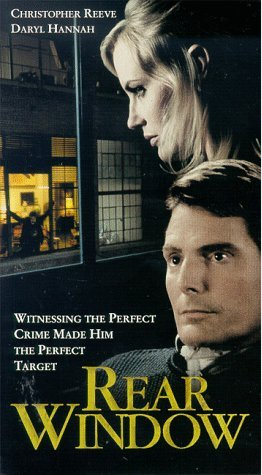 While the murder is the central issue, the subtext is marriage and relationships, from Jeffries and Fremont’s to the killer and his victim, with side trips including the lonely woman and the composer, a newlywed couple, and even the dancer, who seems to be courting as many men as she can get away with, but is in fact waiting for the return of her husband from the army at the end of the film. Credit for this emotional core to the story must go to John Michael Hayes, who gave the script great depth and believability. This was Hayes’ first movie with Hitchcock; he would write three more for the director in the next two years, during an exceptionally productive point in Hitchcock’s career.